Earlier this week at the Ashram, we got to enjoy dessert before lunch! Vidyadevi and I had just settled in our seats in the meditation hall to join Swamiji for japa when Swamiji walked in carrying a large box filled with…bubble wrap? “We’re going to be unwrapping sacred objects today!” she explained. She had received the cardboard rectangle in the mail from India, removed the outer wrapping (cloth, not paper) and wanted to share the first glimpses of the treasures with us. We sat at Swamiji’s feet and each tenderly picked up a tightly-wrapped parcel and she began to repeat our beloved mantra, guided us to repeat it silently as we proceeded. Gingerly, we removed the bubble wrap, and Swamiji indicated that the newspaper and bubble wrap were new innovations. She has used this particular shop for quite some time, and they used to pack all of the items in fabric (this explains the cloth outerwrap!). After peeling away the plastic layers, Vidyadevi and I each revealed a sacred object: a brass bowl and ornate copper spoon. “These are for dipping out the Ganga water to share!” Swamiji said with delight of the sacred source she brought back with her from India. In demonstration and perhaps anticipation, Vidyadevi cupped her hands, brought them to her mouth and passed them over her head, moving through how she would receive the Ganga, enjoying it in space. “I’ve already purified the water in the sun,” Swamiji added. We continued with the objects and revealed two copper trays, one small, one large. The large one had pressed in relief in its center an OM with Devanagari (written Sanskrit) circling it. I asked Swamiji what it said. She lifted it and began to read: Oṃ bhūr bhuvaḥ svaḥ… tát savitúr váreṇyaṃ… bhárgo devásya dhīmahi…Moving through each word, she revealed the Gayatri mantra, a portion of which is expressed in our Ganesha mantras. “This,” Swamiji grinned, “is going in the Amaya® shop!” (psst—that means for you!). She placed the small copper tray beneath the bronze Ganga bowl and set the spoon upon it, beheld it, then gently placed it upon her side puja in front of Nityananda to begin collecting shakti (psst—this is also for you. Enjoy it when you receive the Ganga!). Finally, Vidyadevi removed from the last package a leaf-shaped soap stone incense burner with Ganesha upon it. “Touch it,” Vidyadevi encouraged. I reached out—so soft, and the Ganesha so sweet! “This is going in the Amaya® shop, too,” Swamiji said. (More for you! The next time you are in the Amaya® shop at Kashi, touch it—I know you will love it. And look for both on the online Amaya® shop). By the time we moved out of the meditation hall for lunch, as you may already guessed (and have experienced many times yourself), I noticed I was already full! Such a sweet, delectable sacred feast! This entry was posted in Amaya Shop, Svaroopa Vidya Ashram, Swami Nirmalananda and tagged Amaya, Devanagari, Ganesha, Ganges, India, Nityananda, Puja, Swami, Swamiji on April 26, 2013 by Svaroopa Vidya Ashram. Welcome to two new Board members, Connie (Kanchan) Mohn and Kristine Freeman. They have been supporting the Ashram in many and profound ways as well as deepening their own inner state through their practices and their relationship with Swami Nirmalananda. 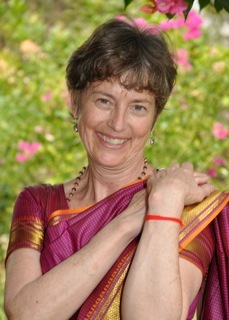 She recommended them to become Board members, serving in a leadership role and position of fiduciary responsibility – to ensure that your donations, tuitions and other funds are dedicated to the Ashram’s purpose: to engage in & teach the worship of Paramashiva, the all-pervasive divine reality, focusing on finding and experiencing the divine within the individual human being. Welcome Kanchan and Kristine! New titles! Board members Amala (Lynn) Cattafi is now a Vice President, serving as Personal Liason to Swami Nirmalananda, and will be expanding her role in communications, specifically to keep Svaroopis and Shishyas up-to-date with everything that is going on. Rudrani (Rosemary) Nogue is now Vice President of Public Communications, having managed our E-Letters and Tadaa! teams for several years now. 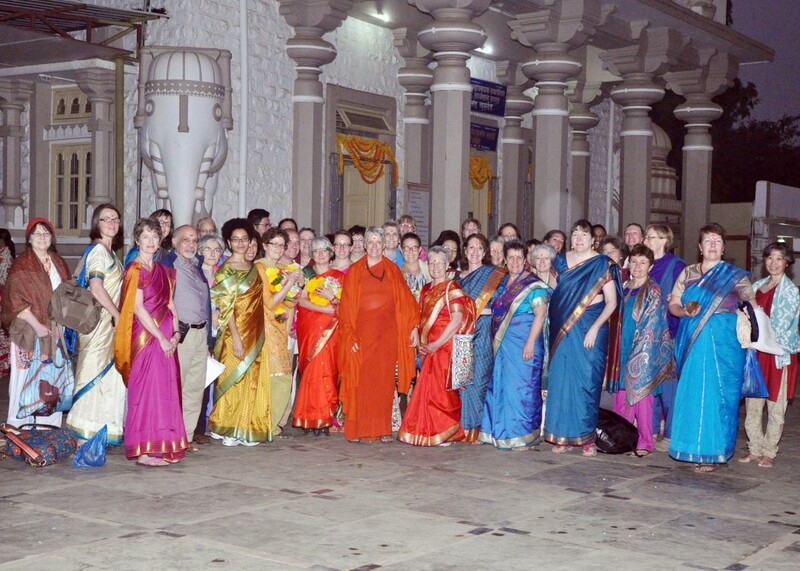 Their new title is an understatement of what they do for the Ashram and for Swamiji, and the value of their support. We are grateful to Tanmayee (Theresa) Reynolds for serving on the Board in our foundational years, serving as our Recording Secretary and Technology Wizard. Most recently she teamed with Glen Christensen (sevite-extraordinare) to move our website to a new hosting company – a move prompted by the need for yogis to be able to access our free audios on their mobile devices. Almost a year of work went into the project, with the last month being a major time crunch, with all hands on deck! Tanmayee worked at all levels in the process, from planning and managing to doing the input and checking others work as well. Thank you for your many offerings, Tanmayee, and blessings to you in your next phase of challenges and growth. We are also saying goodbye to Linda Gambone, who worked on our administrative staff for the last 18 months, serving many of you on the phone as well as in person and by email. It’s been a delight to see her growth into new areas of professional skills, as well as introduce her to yoga and meditation. Thank you, Linda! Amanda Jordan joined our administrative staff at the beginning of this year, and is now expanding her role from part-time to full-time. Since her arrival her, she’s expanded into increasing levels of responsibility due to her diligence, resourcefulness and creativity. We enjoy her cheery greeting every morning and are sure you’ll enjoy getting to know her. This entry was posted in Svaroopa Vidya Ashram on April 15, 2013 by Svaroopa Vidya Ashram. Your donations to the Ashram in the last few weeks have made a big difference, insuring the continuation of our free programs for the rest of the year as well as supporting me in the service I offer you (in the name of my Baba). It is traditional for swamis in India to go from door to door with their begging bowl in hand, for their daily meal as well as for donations that give them access to clothing, transportation, medical care, etc. I feel like I’ve made my rounds, assisted so nobly by our Board members — truly model sevites who are living their yoga. Fortunately I make the rounds only once a year for the Ashram, not daily! Your support has come in donations ranging from $10 per year to $1 per month (which is more than $10/year! ), as well as larger sums, from hundreds to many thousands of dollars. Almost 200 of you have sent in donations, about 5% of those whom we serve through our email and website offerings. It is usually true that the few support the many, and in this case, the few are very loving and generous. It touches my heart to see how you dedicate some of your money to a holy cause – the upliftment of others as well as for yourself. There are many good causes in the world. A number of Svaroopis have recently told me of worthy causes they are supporting — I’m grateful that so many of you have found the Ashram to be worthy of your support. Your gifts have met and exceeded our net goal of $60,000! The Swami Support and Ashram Essential funds are filled and overflowing, while our Temple Builder fund is at 50%, so we’ll wait for another year on the temple and new furnaces. It will take a few days to do all the accounting and analysis, all in the capable hands of Bob Nogue, our Treasurer, and we will give you a full report soon. We still have a few marble boxes from the Taj Mahal available, so new Monthly Donors will continue to receive this gift through the end of April (as well as current Monthly Donors who increase their gift). In addition, of course, our Monthly Donors take advantage of discounted tuition on all our courses as well as on our upcoming Svaroopa® Yoga Conference, Alignment with Grace in Philadelphia from October 4-6 2013. The ash in the boxes — what do you do with it? You have choices! You can use the ring finger of your right hand to place a dot of ash between your eyebrows; especially before you meditate, this is very beneficial! You can take ¼ teaspoon and smear it across your forehead, or even more to spread across all your skin for a yogic (naked) meditation! You can even place a dot of it on your tongue! It’s completely purified (by the fire), and gives you a way of ingesting the mantras and Divine offerings in the yaj~na ceremony. The point is to use it! Thank you for two things — for the opportunity to serve you in this exalted endeavor (your own enlightenment), and for your support that makes me able to serve you. This entry was posted in Svaroopa Vidya Ashram, Swami Nirmalananda, Yoga's Teachings on April 6, 2013 by Svaroopa Vidya Ashram.